This is now the OFFICIAL way to make this printer work. it may or may not fix the manual paper load problem that we’ve seen using the Fuji Xerox drivers. we have not tested these drivers with OS X 10.6. although the new printer architecture should find the printer and install the drivers automatically. If you do not want to use the Dell Drivers for whatever reason(?) the “hack method” below continues to work. 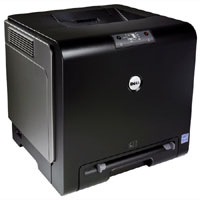 To talk to a networked Dell 1320c Color Laser Printer using OS X 10.4 follow these steps. We have not tested this printer using USB. The steps for OS X 10.5 are nearly the same. The difference is that you don’t have to download the driver from the website. Double click the icon to install after it downloads. When the install is finished you can delete the installer. From the Apple menu open System Preferences and select Print & Fax. Click the + to add a printer. Type the IP address: 192.168.1.177 or whatever it happens to be assigned on your network. You can print the printer settings page by pressing and holding the Continue button on the printer until the Ready/Data indicator blinks. It will print a report that has the IP address of your printer. After you know the IP address you can actually log into the printer from your web browser to change any settings. It is a good idea to make your printers IP address fixed. If you know what that means you should be able to figure out the how to log into the printer to change it. If you don’t you’re “computer guy” should be able to change it in about 5 minutes. Name the printer “color laser” or whatever you’d like it to be. Next select FX DocumPrint C525 A-AP v1.2 in the box below. On the next screen you must select 250 Sheet Feeder as an option. Otherwise it will only manual feed. NOTE: Paper Source is not automatically selected on this printer. It won’t print unless you set it. This is found in the printer options called Printer Features. 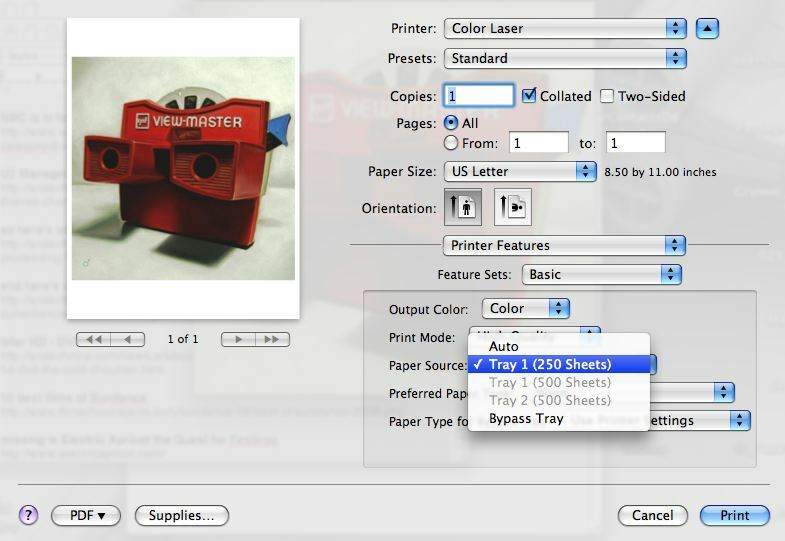 The paper should menu should be set to Auto or 250 Sheet Feeder. Once you’ve made these settings save it as a Profile. Do a Save As… for the Printer Profile. So you don’t have to check this every time the set that Profile as the Default. Select Print Features from the menu. Select Tray 1 from the menu. NOTE: There is NO way to set the main paper tray so it is remembered. 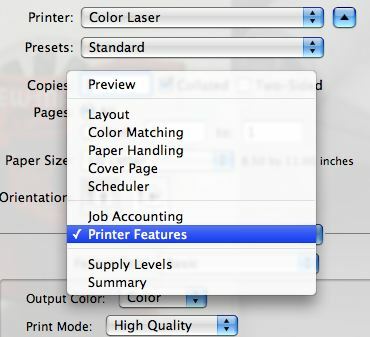 You have to do it manually each time or make a Setting that you select before printing. See the screen shots above. Works a treat with a couple of wee changes. The 1320C doesn’t have a “Continue” button, you press the button with the green light (which in laser circles may be known as the Continue button, but to those of us who don’t hang out in those circles – green light button avoids confusion). The second is when setting “Print Using” in the System Preferences IP window, there was no provision for “FX” on mine, I selected “Select Printer Software” from the drop menu and selected “Dell Color Laser 1320C v1.1” (I’m using Snow Leopard 10.6.5). ……and it all works perfectly. I’ve had this wretched printer for over 12 months now and this is the first time I’ve been able to use it properly! Thanks so much for taking the time to post these instructions. I really appreciate it. I downloaded the FX DocuPrint C525 A-AP driver from the link above and my system (OS X 10.6.6) will not allow the install. That driver was made for 10.4. It won’t work in the 10.6 environment. use the Dell driver instead. ah, so many hours spent on this problem, and then the solution is so easy. thanks again! happy to help. it appears that we need to update the article one more time for 10.7 and dump the links that no longer work. KTHX! I have been struggling to fix an issue with OSX 10.6.8 for a long time, and this driver link worked. Once I had removed all the old Printer Drivers, and references, downloaded the 1.1 driver version above. Re-adding the driver and printer, it now works. Many thanks. My print job disappears from the queue about two seconds after I send it to the printer. The black cartridge light is flashing orange. I am trying to find out if this printer is worth saving. Is the reason that I am having trouble because all cartridges need to be filled to print? Thank you for your assistance in advance. the printer essentially stops working if one of the cartridges is empty. it will just flash after eating the print jorb. there are several 3rd party companies that make toner cartridges for the 1320c. these are significantly less money compared to purchasing from Dell. what 4InkJets offers are slightly more money compared to “other” company. Thanks so much for your help. I am ordering a black cartridge from ebay.